Madeline Mary Margaret Jourdain Williams (aka Mary Hobart Williams) is buried at Woodlawn Cemetery; the entrance to the cemetery is on southbound South Webster Avenue, just south of its intersection with Kalb Avenue, Green Bay, Wisconsin 54301. NOTE: The small headstone is located near the center of the cemetery. There are landmarks to help locate the burial site. See photos below. My name is Madeline Mary Margaret Jourdain Williams. I was born December 15, 1806, the second of eight children and eldest daughter of Marguerite Gravelle and Joseph Jourdain. My father was a Frenchman, born in Quebec. He came to Green Bay in 1798. Our cabin and the blacksmith shop he operated with my older brother, William, were located on the river bank south of what you know as Mason Street. My father was one of the most notable blacksmiths in the area, providing iron tools and household utensils for the frontier settlers and creating trade goods for exchange with Menominee fur trappers. His work was so renowned he once traveled to Prairie de Chien to do work at Fort Crawford! My mother was Metis-French and Menominee. Her father was a Canadian voyageur; her mother was the daughter of a Menominee Chief. My husband was Eleazer Wiliams, an Episcopalian missionary from New York. He arrived in Green Bay in 1821, along with the Oneida and Stockbridge, to settle on land purchased from the Menominee. In 1822 he established a school to educate the French Canadian children. And that’s how we met – I was a student at his school. When I was 16, I was enamored of handsome young officer. We were engaged to be married. One day, when he was away on business, Mr. Williams came to my home to speak with my parents. The next morning, as I prepared to go to school, my sister came to me with the news that I “need not go to school that day” as I was to be married to Priest Williams in the evening! I pleaded with my parents to reconsider, but they insisted, even though we were Catholic and Mr. Williams was Protestant, even though he was 20 years my senior. So, against my wishes, on March 3, 1823, at my father’s cabin in Little Rapids, with Judge James Porlier officiating, I married the Priest Williams. This probably sounds shocking to you, but, in those days, these kinds of marriage arrangements were customary, and even as I fought against it, I knew deep in my heart there was nothing I could do to change my destiny. It was a good marriage for Mr. Williams. I was extraordinarily beautiful, known as the “belle of the Fox River valley”. From my Menominee ancestors, I had inherited 4800 acres of land along the Fox River. And, I was the great-granddaughter of a Menominee Chief! In 1824, my husband took me to New York to be baptized by Bishop Hobart at the Episcopalian Trinity Church. My protestant baptism was considered an affront by the Catholic community, and this conversion later prevented me from being buried alongside my parents in the Allouez Cemetery. The baptism also cost me my beautiful name, Madeline. At the baptism, Bishop Hobart gave me his name and christened me Mary Hobart Williams. Mr. Williams and I settled in a cabin close to Little Rapids, what you know as De Pere, along what you call Lost Dauphin Road. We had three children. My two daughters both died in infancy. But my son, John Lawe Williams, born January 1, 1825, survived. In 1857 we adopted Josephine, the daughter an Indian women I had cared for since she was a small child, and who had come to work for me. Mostly during the 1830’s and up through the 1860’s I kept lists of my monthly activities. I recorded births and deaths, the weather, family visits, the arrival of steamboats, and the beginning of Sugar Camp. I recorded my husband’s trips to Green Bay, Kaukauna, Portage and Winnebago. In 1834 Mr. Williams went to New York. May 1835 I wrote, “Hard frost – killed all the beans and everything in the garden.” I was left for weeks with only oats to eat! And right after that, in October, I recorded that it snowed very hard, and in November, I wrote about the new stove I'd ordered! I recorded the names of the constant flow of notable Green Bay personalities who visited our home. Judge Lawe and his wife. The Grignons and their wives. Morgan L. Martin, to name a few. The Oneidas came to fish along the Fox River. Visitors described my home as “neat as wax”! I even wrote about my sweet Jolly – a wonderful dog, part bulldog and part beagle. I imagine you’re curious about all those stories going on about Mr. Williams. As I mentioned earlier, he was an Episcopal missionary to the Oneida Indians in New York and came with them and the Stockbridge tribe to Green Bay in 1822. He was himself certainly of noble blood. But what created all the hoopla was a great confusion over the story of his birth. One story traces his ancestry to King Henry VIII, Elizabeth of England and Oliver Cromwell. The other story, identifies him as the Lost Dauphin, Louis Seventeenth of France, the beloved son of Louis XVI and Marie Antoinette. The English version provides Mr. Williams with a Mohawk mother and father, grandmother and grandfather, and a great grandfather whose wife was Eunice Williams, taken captive with her family and 110 others during an Indian raid against a Massachusetts frontier settlement during Queen Anne’s War. Eunice Williams chose to stay with her captors, even when given the opportunity to return to New England. Eunice descended from Robert Williams of Roxbury – oh, it’s quite convoluted – but it leads back to the house of Tudor --that’s Henry VIII -- to Brutus the first king of Briton, who began to reign about 1100 years before the Christian era. Marie Antoinette dearly loved her pretty little boy. It is known that he shared with his parents all the horrors of the French revolution. He was with them when the mob carried the king and queen in that wild march to Paris, he was with them in prison. After the king was beheaded, the guards took Marie Antoinette’s son from her and she never saw him again. The child was given over to a brutal cobbler for a jailer. The little prince was beaten, starved, and swore at. He was taught revolutionary songs. It was fully intended that he should die. But there were those who were determined to save the little prince from this fate. The jailors were attacked, a deaf boy was left in his place, and the prince was brought to America and given to the Iroquis Thomas Williams. It was said it was common knowledge of those high in authority that the prince did not die at the hands of his jailers. Thomas Williams had 11 children. All their births are recorded in the church record, save the birth of Eleazer Williams! People argued that my Mr. Williams bore no appearance to the Indian race. His hair was black, but not coarse. His eyes were hazel. He was tall, large and portly. But, even as a child, the French refugees called him “Little Dauphin” because of his resemblance to the royal family and his air of command. That he descended from a most distinguished ancestry, even his enemies admitted. His friends claimed the Lost Dauphin story; his enemies denounced it. What did I think of all this fuss about my husband’s ancestry? Well, I’ve already related to you the primary contents of my journals haven’t I? –little Jolly, the visitors to our cabin, the fruits of my garden, inclement weather . . . oh, and my new stove! The mystery of his heritage had an impact on Mr. Williams’ work with the Oneida. He began to neglect his flock, seldom visiting them at their location on Duck Creek. In 1832, his association with the Oneida was dissolved at their request. By 1842, he was forbidden from representing the Episcopal Church in any capacity in Wisconsin. For a while after that Mr. Williams lived on my property. Eventually he returned to New York, to the St. Regis Indian Reservation in Hogansburg. There he died on August 28, 1858. In the meantime, my son John married. For a while he lived on a farm in Winneconne, but eventually settled with his family in Oshkosh. He had three sons. Two died young, but the oldest, George, lived to adulthood. One day, while in the woods in Tigerton, John was fatally injured by a falling log. He died September 22, 1883, and was buried in the cemetery in Oshkosh. He was 58 years old. I never got over the death of my son. The last year of my life my health deteriorated quickly, and I spent my final three months bedridden. I died in my cabin on the Fox River on July 22, 1886. I was 79 years old. I left the bulk of my respectable estate to my grandson, now a well-educated citizen of Oshkosh. The house and all its contents, along with 65 acres of farmland, were left to my adopted daughter, Josephine. My dairies are located in the library of UWGB. A fine oil painting of Mr. Williams was sold at auction in New York and is now in Philadelphia. My cabin was razed and the land turned into a park – Lost Dauphin Park – complete with a state historical marker telling of the mystery of Mr. Williams’ heritage. I’m mentioned, but only as the daughter of Joseph Jourdain! Well, now you know my name and that there’s much more to the story than what’s written on that marker. And if you should take the time to visit the park and read that marker yourself, I hope you will remember our visit tonight, and my story, too. NOTE: Discrepancies regarding Madeline's age at the time she married vary; at the time of my research, I was unable to confirm the exact year of her birth. See also, Marker 105: Eleazar Williams, a related marker regarding Madeline's husband, Eleazar Williams, located at the site of their home along the Fox River at nearby Lost Dauphin Park. The original headstone, now illegible . . . The restored side of the headstone. The elk in the distance is one way to find the gravesite. The elk is facing Madeline's gravesite. Looking northwest-- the small headstone is just to the right of center. See that beautiful monument across the roadway? Another way to find the gravesite. The monument across the roadway from where Madeline is buried. Could photograph this statue all day long! 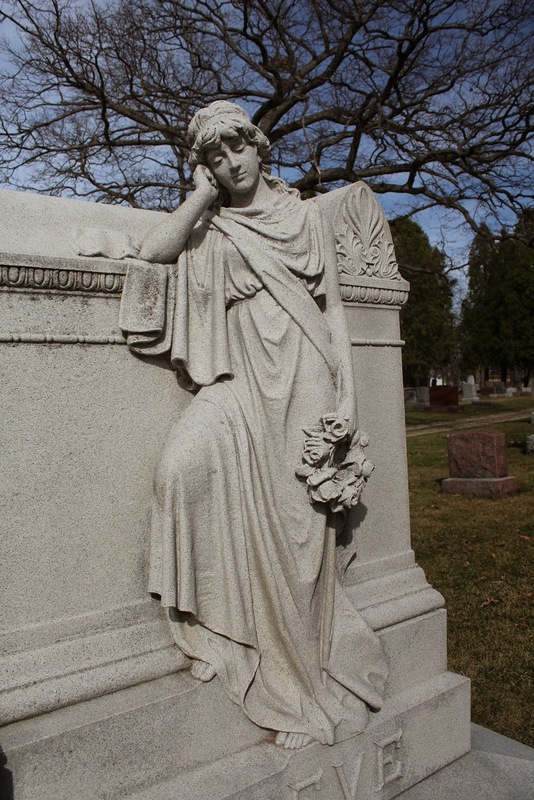 Madeline is buried at Woodlawn Cemetery in Green Bay.